Many lives could have been saved in Puerto Rico had the Trump administration reacted more quickly and more efficiently. The dead cant be hidden. They cant be erased. Somebody knew them. They leave behind a void, photographs, memories. They can even come back to haunt us. This is why its absurd that President Donald Trump is claiming that almost 3,000 people in Puerto Rico did not die in the aftermath of Hurricane Maria a year ago. The president says he believes the Democrats made up that number to make him look as bad as possible. This is perhaps the biggest lie that Trump has told so far during his administration. A comprehensive study conducted by researchers at George Washington University (bit.ly/2wwqEqF) estimated that 2,975 people died within six months of Hurricane Maria, which hit Puerto Rico on Sept. 20, 2017. How did researchers come up with that number? Using official death certificates, researchers calculated an average annual death toll on the island under normal circumstances, from 2010 to 2017. Then they compared that average against the number of Puerto Ricans who died from September 2017 to February 2018. As a result, they obtained a figure known as excessive mortality, the number of deaths due to a specific circumstance, such as a disease or a natural disaster. In short: If Hurricane Maria hadnt hit Puerto Rico, 2,975 more people would probably still be alive today. But Trump doesnt understand neither facts nor numbers. He lives in a bubble. His magical thinking makes him believe that only what he says is true. First, we saw the humiliating images of Trump tossing paper towels into the crowd during his brief visit to Puerto Rico. Then, it appears the Federal Emergency Management Agency treated the hurricane victims in Texas much more favorably than those in Puerto Rico. According to an investigation by Politico, nine days after Hurricane Harvey, FEMA approved $142 million to help Texans, while the agency had allocated in the same time frame a mere $6 million for the victims of Hurricane Maria. During that period, 5.1 million meals were distributed in Texas, compared to 1.6 million in Puerto Rico. Texans received 4.5 million liters of water, while Puerto Ricans received 2.8 million liters. Trump, in his tweets, says he doesnt understand how the official death toll changed from 16, the estimate when he visited the island two weeks after the hurricane, to almost 3,000. The explanation is not complicated at all. 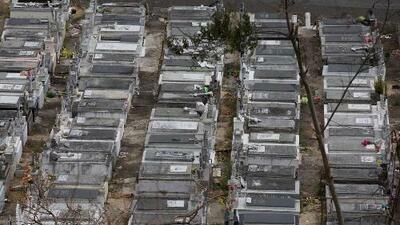 Its cruel to deny that so many people died after such a powerful hurricane. Its almost worse to call the administrations response to Hurricane Maria a success, as Trump has done. The families of the victims wont allow him to erase the dead like that.